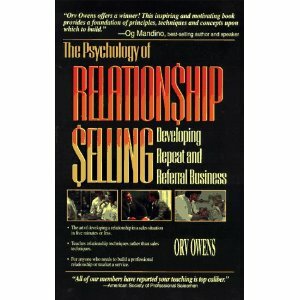 In the early ninety’s I was introduced to a great sales book called the Psychology of Relationship Sellingwritten by DR. Orv Owens. In this manual for sales people the topic discusses the motivations of the buyer and the fear triggers of both the seller and the buyer, how they work together in the art of the sales process. I am not an author of DR. Owens magnitude nor do I claim to understand phycology at his level. But referencing the book the other night I wondered how some of the insights of this manual may have changed in the new era of social media and the no face to face contact sales tools of Twitter, Facebook, YouTube, and LinkedIn. Since this is a Blog and not a book let me just focus of four comparisons to get the conversation started. In his book Psychology of Relationship Selling Dr. Owens labels five personalities / motivations which he challenges sales people to identify on first meetings and to quickly chart a course of communications that best fit that personality. Four of the five are Fear motivated Personalities and the Fifth is Love Motivated Personality. Fatalist – Motivated by fear of failure / fear of responsibility – This personality has traits of someone whom always has a story for not taking on responsibility , they stand you up on appointments, have bed credit and have a difficult time staying on one job. This personality has a belief that every thing they try is a disaster and so the fear of failure makes them refuse to TRY. Exasperator: – They are the Exasperators, they argue with you about everything. If you say it is a beautiful day they will tell you it is the opposite. They are physical beings. You see, with the exasperator, you are not their friend, you are THEIR FRIEND! They own you! DR. Owens goes on to tell us that Exasperators are the guys that drive the steam roller on the highway repair crew, very energetic and physical. Appraiser: – The organized one in the crowd. They fear unorganized or non-structured environments. Accurate, accountable, Absolute, Anti-social the Appraiser might be best described with the word Actually. When saying the word Actually to n Appraiser you take them forward in the conversation because they are going to want to get pas the fat to the core of the issue. Relater: – People oriented, they love the social world and love people. They fear ridicule so tend to keep it safe. They like to please everyone. Your Respect is their desired prize. A Give and receive attitude that centers around what they give and the thank you that you give back. They want some responsibility but maybe not the top or best in the office. They are reactionary in nature. Love Motivated individuals: Have recognized the four fears above and conquered them: fear of rejection, fear of ambiguity, fear of loss of position and fear of failure. Love motivated individual will have the following; love of self, love of authority, love of family, love of people, love of productivity. They are more friendly than the relater, but won’t get upset if someone dislikes them, they more of a perfectionist than the appraiser, but are flexible with people and perfectionists with things. So how does that apply to Social Media in todays sales word? First realize that all five traits are in everyone, but individuals will have a strong trait that drives their actions. It might seem that the perfect answer would be that the Relater or the Love motivated individual would be the prefered customer or friend in social media but I feel that it is not about who is best but about if you can identify them and customize communicate with them in order to move the prospect or friend into a customer. Fatalists on Social Media could look like this: They work hard at communicating with you, they seem engaged however always are missing a meeting or have an excuse why they have not finished an exercise you requested of them. When you push them to commit they will disappear on you because they are sure that they about to fail or are going to lose miserably because they believe that they always fail. These are the prospects that often sound like a positive lead that drag you along for as long as possible but then never come through. they are your pipeline clogger. Exasperators: these are your Power friends on Facebook and Twitter. they respond to every photo and commit because they want everyone to know they own you. They will test your patience, they will argue with you on everything. They are hard to get a commitment from because they enjoy the position of power and want buying to be their decision. And that is the key, you must give them the power and make it sound like it is their idea, not only that but since it is their idea they are doing you a favor in buying it. The Appraiser is definitely turned off by the unorganized social media presentation. A webinar with lots of disruption and un-organization will turn them off to your company or idea. You are considered dangerous or a company which can’t handle their important business. They will be impressed with dashboards and tools which give detailed reports. Great statistical analysis will give them a feeling of comfort and trust. The Relater they love to follow you and listen to you and to share with you in order to gain respect. They will share insight and talk with you in length to understand the process, your part in the company and how your relationship will continue in the future if they buy. It is important that this is a relationship that does not end with the sale. this is the Facebook user that will commit on your status and will be hurt if you don’t commit on their commit. In the sales process you must commit to the relationship and show them respect and love in return. The Love Motivated Consumer is all about the learning and growing of self.They appreciate your adding to the value of their lives and are encouraged by the new tools and education your bring to their lives. However they also don’t always feel like they need anything, they are good, they love the relationship part of the relationship but might not want to buy from you. they need you to be love motivated also, and will politely dismiss you if you are not. If you lose this sale you might check your motivations at the door. If you would like to understand this more, do yourself a favor and get a copy of Dr. Orv Owens book. It is obviously more complicated than I have made it, but I thought the concept was something that needed to be explored. Give me some feedback and let’s develop this thought further.